The Orange County Lingual Institute is the premier language school in Orange County, offering French classes for all levels of California students. The French courses are taught at our new Orange County facility next to the South Coast Plaza and the Segerstrom Center for the Arts in Costa Mesa at a cost of $225 per eight-week term. Formerly the Orange County branch of the Beverly Hills Lingual Institute, we take pride in offering Orange County’s premier French language instruction using highly educated native-speaking teachers and university text books. 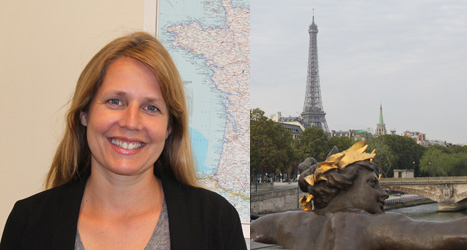 French language tutors are also available for private instruction and corporate programs. When you want to learn French in Orange County, the award-winning Orange County Lingual Institute at South Coast Plaza is your best choice. We offer the most comprehensive schedule for Orange County French Classes. We have a level and time right for you. From beginning to advanced, all classes meet once a week for 80 minutes during each eight-week term. Below are the scheduled French language classes. If your learning level and preferred time is not shown, please call; we often add beginning classes after the schedule is published in order to accommodate the higher demand to learn French. 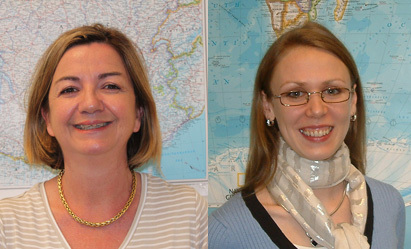 Alternatively, you can select a semi-private French class or private French lessons to learn French at any level. Please note that the Little Lingual class for children ages 6-11 meets for 60 minutes each week and costs $250 per term. Our French language school hires and keeps exceptional teachers, creating a dedicated student body and a supportive atmosphere for learning French. Being surrounded by other students who are interested in the French language and culture reinforces an individual’s interest and motivation, and learning together creates a pleasant and exciting educational experience. 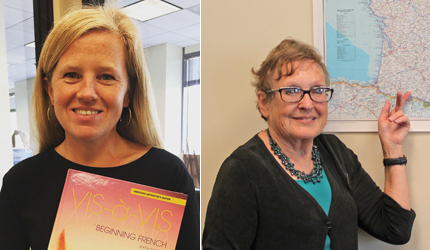 The faculty and French courses at the Orange County Lingual Institute are proven effective and extremely popular with Orange County-area residents. Come enjoy the French learning experience that many others in the Orange County area have discovered, including people from the communities of Costa Mesa, Anaheim, Santa Ana, Irvine, Huntington Beach, Garden Grove, Orange, Fullerton, Mission Viejo, Westminster, Newport Beach, Buena Park, Lake Forest, Tustin, Yorba Linda, San Clemente, Laguna Niguel, La Habra, Fountain Valley, Placentia, Rancho Santa Margarita, Aliso Viejo, Cypress, Brea, Stanton, San Juan Capistrano, Dana Point, Laguna Hills, Seal Beach, Long Beach, and other nearby cities. Come experience high-quality French courses in Orange County. French is one of the most international languages in the world. Spoken in the home country of France and in many former French Colonies, French is a popular second language useful for the arts, travel, and fine living experiences. For many years French has been one of the the most popular languages taught at the Orange County Lingual Institute. We have a very robust French Language program that has guided hundreds of people to higher levels of fluency. It truly is a combination of the best French teachers, the best textbooks, and a great learning environment. When you are looking for the best French Classes in Orange County you must start with the Orange County Lingual Institute. Classes are always amazing and interactive. It is fun to come to class. It is fun, interesting and convenient. Friendly staff, good teacher, nice place. The classes have been a great way to learn the correct way and speak and construct sentences. This is a perfect way for me to learn.